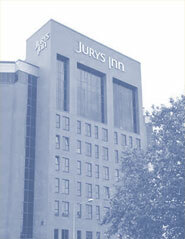 You certainly can’t fault the hotel’s location in Central Swindon, but will the Jury’s Inn do it justice? Find out here. The Train Station is just a 10 minute walk away and every guest of Jurys Inn who presents their keycard at the Swindon Designer Outlet – just down the road – will also receive a 10% discount on purchases. The 29 standard en-suite bedrooms are spacious and pleasant and come equipped with air-conditioning, multi-channel flatscreen TV, high-speed Internet access and some above average power showers. The hotel’s Innfusion restaurant offers some quality wines at reasonable prices and though some guests may have commented on some fairly under whelming menus there is wide choice of foods on offer and the atmosphere is friendly and relaxed. In addition to a bar serving alcohol, soft drinks and snacks there is an on-site Coffee Bar with a worthy variety of speciality coffees and teas to be enjoyed over a chat with friends.